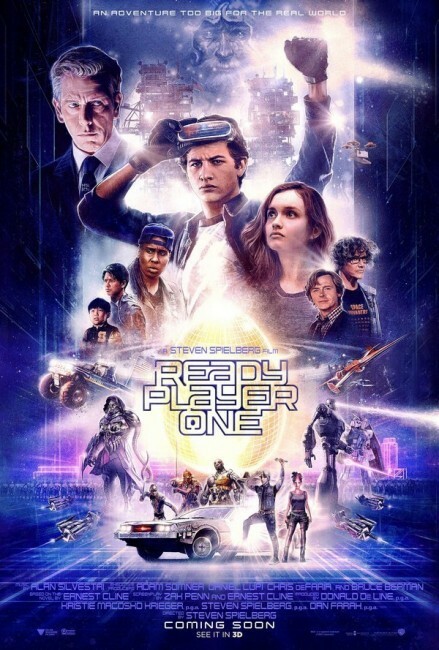 Director – Steven Spielberg, Screenplay – Ernest Cline & Zak Penn, Based on the Novel by Ernest Cline, Producers –Donald De Line, Dan Farah, Kristie Macosko Krieger & Steven Spielberg, Photography (3D) – Janusz Kaminski, Music – Alan Silvestri, Visual Effects Supervisors – Matthew Butler, Grady Cofer & Roger Guyett, Animation Supervisor – David Shirk, Visual Effects/Animation – Industrial Light and Magic (Supervisors – Danielle Bigi & Dave Dally), Visual Effects – Digital Domain (Supervisor – Joel Behrens), Special Effects Supervisor – Neil Corbould, Production Design – Adam Stockhausen. Production Company – Amblin Entertainment/De Line Pictures. Columbus, Ohio, the year 2045. Wade Watts is a teenager living in the slum area known as The Stacks. Known by his avatar Parzival, he is an avid player in the virtual realm known as The Oasis. The Oasis’s designer James Halliday died six year earlier, leaving behind a multi-trillion dollar fortune but no heirs. However, Halliday has set up a vast treasure hunt with clues hidden amid a series of Easter Eggs from all the favourite films and videogames throughout The Oasis, the deciphering of which will allow the winner to inherit his fortune and control of his empire. Wade is one of numerous people, nicknamed Gunters, who seek to decipher Halliday’s clues. Their rivals are The Sixers, a team headed by Nelson Sorrento, a former Halliday associate, who now runs Innovative Online Industries corporation and is ruthlessly determined to obtain the prize at all costs. During the course of the hunt, Wade meets and is attracted to a rival Gunter named Art3mis, although is warned that she could be anybody in real life. Wade then becomes the first to decipher the clues and win the first key. This makes him, Ar3mis and his friends, who become the next ones to make it through, targeted by Sorrento and IOI who are determined to prevent them from completing the challenge before they do. I received an e-book reader as a present some months ago and Ernest Cline’s novel Ready Player One (2011) ended up being one of the first novels I read with it. I promptly found it to be a highly engaging read that I consumed all in the space of about two days – there are not many books that get that kind of hold on you. The book is the ultimate fanboy homage to 1980s nostalgia. It is a breathlessly exciting treasure hunt through a world conceived to highlight and reference 1980s videogames, films, tv shows, role-playing games and music. Ernest Cline was born in 1972 so that is the era he grew up in (it should be noted that James Halliday the omniscient geek guru who set up the treasure hunt shares the same birth year as Cline). I grew up around the same time so fairly much everything that Cline references in the book is very familiar to me. Beyond writing his debut novel with Ready Player One, Cline seems like someone who has managed to turn the enviable task of being a fanboy into a full-time profession. The work that first gained him attention was apparently a spec script for the long-promised sequel to The Adventures of Buckaroo Banzai: Across the Eight Dimension (1984). His first professional sale was the script for Fanboys (2008) about a group of fans setting out to visit the Skywalker Ranch. His second novel, the far-less engaging Armada (2015), winds in another barrage of 1980s pop culture references as a teen videogamer is transplanted into an intergalactic war. 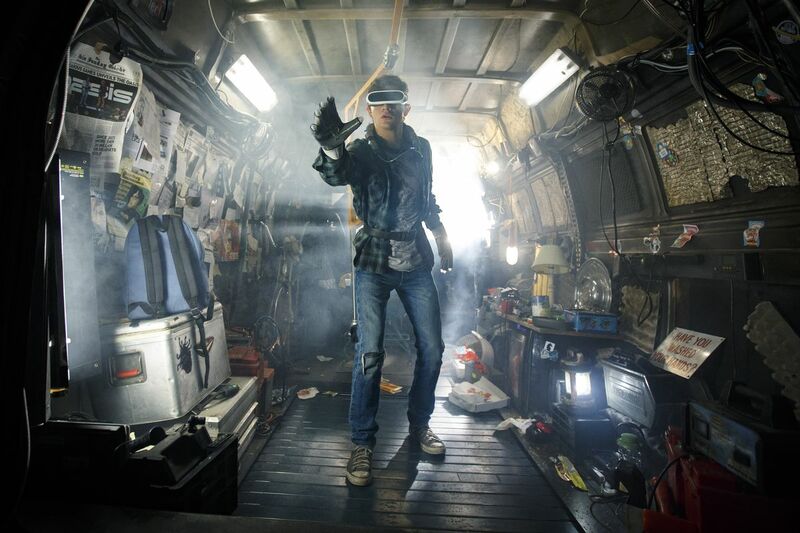 The film version of Ready Player One has been taken on by Steven Spielberg, a figure who has had immeasurable influence on 1980s pop culture himself with key works of the era such as Raiders of the Lost Ark (1981) and E.T. – The Extra-Terrestrial (1982). (See below for a full list of Steven Spielberg’s other genre films). Ernest Cline adapts his own novel, co-writing with Zak Penn, who has turned out scripts for the likes of Last Action Hero (1993), Inspector Gadget (1999), Behind Enemy Lines (2001), Suspect Zero (2004) and various Marvel Comics adaptations such as X2 (2003), Elektra (2005), X-Men: The Last Stand (2006), The Incredible Hulk (2008) and The Avengers (2012), as well as directed the hilarious mockumentary Incident at Loch Ness (2004). In the film, Spielberg hits you with Ernest Cline’s full-on barrage of 80s pop culture amplified by the factor of ten. The opening set-piece features characters on a frenetic race through a virtual realm in vehicular replications of the lightcycle from Tron (1982), the motorcycle from Akira (1988) and the Batmobile from tv’s Batman (1966-8), while Wade drives a replica of the DeLorean from the Spielberg-produced Back to the Future (1985) as they face attack by King Kong (1933) and the T-Rex from Jurassic Park (1993). Elsewhere throughout The Oasis, we get appearances from Batman, Marvin the Martian and Beetlejuice, plus references made to The Dark Crystal (1982). Sorrento and I-R0k meet in a scene that replicates The War of the Worlds (1953). One of the challenges involves an elaborate mock-up of the Hotel Overlook from The Shining (1980). The soundtrack is a Best Of series of hits from the 1980s, including Parzifal and Art3mis dancing to Stayin’ Alive (1977) in the virtual nightclub – a date where Parzifal fashions his outfit on Buckaroo Banzai. In Aech’s workshop, we see models of the Battlestar Galactica, the Valley Forge from Silent Running (1972) and the Sulaco from Aliens (1986). The climactic battle features appearances from The Iron Giant (1999), Mecha-Godzilla, Jason Voorhees from the Friday the 13th films, Freddy Krueger from the A Nightmare on Elm Street films and Chucky from the Child’s Play films. And there are probably countless other references that I didn’t pick up. I hugely enjoyed reading the novel. By contrast, I mostly enjoyed watching the film but never quite gained the same immersive buzz from it. The quest plot has been entirely changed when it comes to the film – in the book, the quests involve completing Dungeons and Dragons modules, games of PacMan, clues based on Rush lyrics and replications of a scene from WarGames (1983). Here these have been replaced by only three keys with the road race, the replication of scenes from The Shining (where Stephen King’s unhappiness with the Stanley Kubrick film version forms a vital element of the clue) and the final videogame. In has also come an element of the quest that involves Halliday’s unfulfilled desires that was never there in the book. The events have been substantially rearranged – Art3mis, for instance, is introduced in the flesh well before the halfway mark, whereas in the book the finale of the story was the meeting between the two characters who had only previously been attracted virtually. Now she is also involved with some kind of revolutionary organisation/commune, which is given no explanation. The film rearranges the third act of the story, which had Wade obtain a fake identity and go undercover as an IOI employee to infiltrate the organisation, whereas now Art3mis is captured by IOI and the others set out to rescue her – part of which involves a credibility-defying scene like something out of the climax of Star Trek: Insurrection (1998) where they manage to instantly whip up an identical virtual simulation of Sorrento’s office to fool him as he exits The Oasis. It often feels as though Spielberg has stripped the book down to a series of highlight scenes – the virtual nightclub, the hack-in to IOI, the climactic Battle Royale where he has ordered Industrial Light and Magic to go away and imagine their wildest – and tossed out the rest, substituting more spectacular scenes whenever he sees fit. At other times, Spielberg tries to find visual equivalents for scenes that didn’t really need them – the scenes of the characters fanatically poring over Halliday’s life and works he enjoyed are now represented by a virtual museum with even virtual replicas of scenes from his life. The upshot of this is that while the book is filled with copious amounts of 1980s nostalgia and plays a unique treasure hunt through it, the film has stripped that back to a wild barrage of visual quotes from the 1980s (and other eras). Some of this. like the replication of The Shining and the climactic battle, plus cute throwaway gags like where Art3mis has her face eaten off by a chestburster or the appearance from Chucky, are a lot of fun. The treasure hunt is there but is hurried by too quickly without the lack of fascination in watching Wade and the participants work out the clues that it had in the book, thus lacks the same intellectual fascination. Beyond that, you are left with some questions about the world that Ernest Cline and Steven Spielberg create. Both do very little to explore what exists beyond The Oasis except for a financially depressed sector known as The Stacks and a monolithic evil corporation that seeks to own everything. Much and all as nostalgia is enormous fun, I question a world that seems to only look back at the popular culture of previous decades and has created no original content of its own – the equivalent would be people of 2018 looking back 60 odd years to the culture of the 1950s, being obsessed with recreating it but tuning out anything that has been created after that point. We never see people do much to interact with the world outside of Virtual Reality. This all may well say something about how creativity is dead and virtuality has taken over everything but in its rush of nostalgic cool for all pop culture matters bygone, this is something that the film regards with an oddly uncritical eye. There are some questions about the set-up of The Oasis that one would question or at least seem to diverge from the way today’s MMORGs are designed. The players seem to have no ability to restore their own lives at a point where they left off (as is the case in most videogames) – when they are killed in the game, they are essentially killed for real and have to earn their way back up from the newbie positions again (something that would surely turn a lot of players off and/or make the games filled with far more vicious in-fighting among players). In complete contrast to real life, none of the visual world seems to contain any advertising, which is the financial backbone of almost any online operation these days. The other is the complete anonymity of users whereas in real-life things have gone entirely the other way and websites have demanded more and more personal information from users to be mined for potential advertising revenue. There also seems something datedly obsolete about the notion of IOI expending vast amounts of effort and hiring mercenaries to track down the High Five when in present-day reality all of this could fairly easily have been done simply by tracking the IP addresses they use. I’d also question the sanity of handing a multi-trillion dollar corporation over to the control of a bunch of teenagers solely because they are the ones who appreciate the spirit of fun with which the original pop culture artefacts are intended – did nobody watch The Social Network (2010) to see how that turns out in reality?